LONDON, England -- President Vladimir Putin’s surprise tactical retreat over Ukraine may have reduced the possibility of military conflict for now. Away from the frontline, however, a battle between Kiev and Moscow has long been raging; it is a war of symbols. Since the Ukraine crisis began, pro-Western demonstrators have toppled statues of Vladimir Lenin, and regional authorities across the country have re-named roads and squares in honour of the “Heroes of Maidan”. Pro-Russian separatists, meanwhile, have raised their own flags over occupied governmental buildings and desecrated statues of Ukrainian heroes in Crimea and the eastern city of Donetsk. It is those symbols related to the Soviet Union’s victory over Nazi Germany in the “The Great Patriotic War”, however, that are most fiercely fought over. Ever since the fall of Ukrainian President Viktor Yanukovych’s regime brought a pro-Western interim government to power in Kiev, Moscow has played up World War Two-era rhetoric to dismiss the authorities as “neo-Nazis” and “Fascists”. The Kremlin has accused Kiev of glorifying Stepan Bandera — a nationalist leader who, during World War Two, proclaimed an independent Ukrainian state that would work with Nazi Germany. After a fire at Odessa’s Trade Union building on 2 May led to the deaths of 42 pro-Russian separatists, a pro-Kremlin Russian lawmaker described the event was a “new Auschwitz”. The United States may have begun to refute some of these allegations, but Kiev has largely refused to be drawn into the Kremlin’s propaganda. On 5 May, lawmakers introduced draft legislation to the Rada, Ukraine’s parliament, that would see certain Russian symbols classified as “extremist”. One symbol was specifically named: the St. George ribbon. 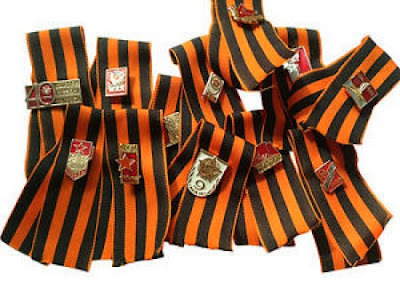 Established in 1769 as The Order of St. George – the highest military decoration in the Russian Empire – the orange-and-black striped ribbon survived until the revolution of 1917. Closely associated with military valour and patriotism, Joseph Stalin revived the ribbon during World War Two and incorporated it into a number of medals. At the Kremlin’s initiative, the ribbon was distributed throughout Russia and much of the former Soviet Union on 9 May 2005 – the 60th anniversary of Victory Day. And each year since then, on the same day, the ribbon has reappeared. This year, over100 million have been distributed around the world. Putin understands the political utility of symbols like few other world leaders. Shortly after he was elected President in 2000, he set about establishing new national symbols in Russia. He saw this as a way to re-present Russia as a great power, and mark a break with the country’s chaotic 1990s. Putin oversaw the restoration of the Soviet Union’s anthem as Russia’s national anthem (albeit with new lyrics), and, in September 2000, reinstated The Order of St. George. He has used Victory Day to promote a new post-Soviet national identity in the country; one based around loyalty to the state. And every year, Russia explodes in patriotic ecstasy as the Kremlin demonstrates its strength in one of the grandest military shows on earth, on Red Square. For those who wear the St. George ribbon, it is a sign of the Soviet Union’s victory over Nazi Germany during World War Two. For those who don’t, the ribbon is a provocative symbol of growing conservative and imperialist attitudes in the Kremlin. The ribbon was prominent in this year’s May Day and Victory Day celebrations in Moscow, while Russian politicians wore it in the Duma when Russia annexed Crimea in early March. These are attitudes that analysts believe Putin is harnessing in Russia to boost patriotism, increase his popularity and shore up his regime. Such feelings are becoming increasingly widespread in the former Soviet Union. For those who oppose the ribbon in Ukraine, it also embodies a perception — not entirely unfounded — that the Soviet Union committed acts of aggression against Ukraine in World War Two. Kiev and Moscow espoused different World War Two narratives long before the Ukraine crisis erupted. In 2006, President Viktor Yushchenko established the Ukrainian Institute for National Memory in an attempt to reclaim Ukraine’s history from the Soviet era. These gaps, however, have widened as the St. George ribbon has become closely associated with pro-Russian separatists. It has been incorporated into badges and flags, taken up by pro-Kremlin groups such as the National Liberation Movement, and been visible at protests in Crimea, Donetsk, Odessa and elsewhere. Together with other anti-Madian symbols (such as the Berkut eagle, and Novorossiya flag), the ribbon has become “ubiquitous” at separatist protests. So intimate has the St. George ribbon become with Russian power and imperial nostalgia that even Europe’s last dictator — Belarus’ Aleksandr Lukashenko — and Central Asian autocrats fear the ribbon might encourage pro-Russian separatism in their countries. This fear, long felt in the Baltic countries, has been heightened since Putin appointed himself the protector of ethnic Russians throughout the former Soviet Union. As pro-Russian forces continue in their efforts to dismember Ukraine, Kiev has dropped the ribbon as a symbol of Ukraine’s Victory Day celebrations. Instead, it has adopted the Red Poppy, the European symbol for war victims. The poppy contains the phrase “1939-1945 Never Again”, in reference to what some in Ukraine believe was both Nazi and Soviet aggression during World War Two. There have also been suggestions that Ukraine may shift the date of Victory Day to 8 May, the exact date of Nazi Germany’s surrender (according to European time zones). Through its state-control of media, re-writing of school textbooks, and silencing of dissent in Russia, Moscow has made its policy on history clear: it will not tolerate accusations of Soviet cruelty during its liberating crusade of Europe from fascism. As Ukrainians look to the future — the country’s presidential elections are scheduled for 25 May — the country is battling for its past.